Margaret A. Donegan, age 82 passed away at her home in Bridgewater, NJ surrounded by her loving family on January 18, 2019. 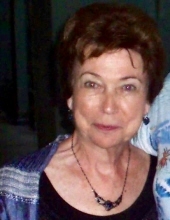 Peggy is survived by her five children and their spouses, Kathy & Brian Casey, Patty & Chuck Freyberger, Peggy & John Reilly, Mary Ryan and Jim Russell, Tom Donegan and Carlos Baudino, her ten grandchildren, Matt Reilly and his wife Brit, Jenn Casey, Chris Reilly and his wife Mariel, Shannon Casey and her husband Josh Gantomasso, Billy Freyberger, Ryan Casey, Sean Casey, Michael Freyberger and his wife Amy, Kevin Reilly, Lizzie Ryan and her great grandchildren Riley Gantomasso and Ruth Freyberger. She is preceded in death by her loving husband Joe, her parents, Margaret and Myrvan Burns and her beloved brother Jim Burns. Born and raised in North Arlington, NJ, Peg attended Queen of Peace School before attending college and meeting the love of her life, Joe Donegan. After their marriage, they spent several years stationed in Germany while Joe served as a lieutenant in the US Army. In 1962, they returned to her childhood home where they raised their five children. Peg spent 25 years impacting the lives of endless students and coworkers as an educator in the North Arlington school system. She was a pioneer of the Character Education program and will always be remembered as a caring and compassionate individual who encouraged others to find and recognize the value of themselves. For their retirement years Peg and Joe moved to Brick, NJ where they spent over twenty years enjoying continuous visits from their children, grandchildren and dear friends. During those years she dedicated her time to community service and was an active member of her church where she volunteered to spend time with the elderly. She always felt the presence of God in the beauty of nature and the peacefulness of sunsets. One of her greatest pleasures was sitting on her deck with a cup of coffee or glass of wine enjoying the moment. After a series of illnesses, Peg and Joe settled at the Chelsea of Bridgewater as their final home. Here she impacted the lives of the residents and staff with her kindness, love and endless hugs. Peg was treasured by her family, her friends and anyone who had the privilege of knowing her. Viewing will be held on Monday, January 21, 2019 from 4-8pm at the Branchburg Funeral Home 910 US Highway 202 South, Branchburg, 08876. Funeral services will start with prayer at the funeral home on Tuesday, January 22, 2019 at 8:45am followed by a 9:30am funeral liturgy at Immaculate Conception R.C. Church in Somerville. Interment will follow at Holy Cross Cemetery in North Arlington. To send flowers or a remembrance gift to the family of Margaret A. Donegan, please visit our Tribute Store. "Email Address" would like to share the life celebration of Margaret A. Donegan. Click on the "link" to go to share a favorite memory or leave a condolence message for the family.